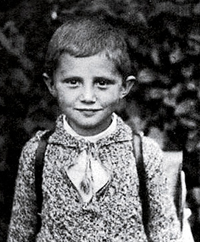 From the Catholic News Agency comes this charming report: a Christmas letter written by seven-year-old Joseph Ratzinger to Baby Jesus is on display this Advent in the Bavarian town of Marktl am Inn, where he was born. The first thing the Pope wanted was a Schott, one of the first prayer books with the missal in German and a parallel text in Latin. At the time there were two editions in the country, one for adults and one for children. The Pope and his brothers used to play the “game of the priest,” and their mother, a seamstress, would help them by making clothes similar to those worn by priests, according to an “Inside the Vatican” interview his brother, Monsignor Georg Ratzinger, gave a few years ago. He also asked for a heart of Jesus, referring to an image of the Sacred Heart, which his family was very devoted to. Read the full CNA story, which includes details about the Christmas letters of the Holy Father’s brother and sister, here.